February is National Pet Dental Health Month, and we are getting all geared up to clean some teeth!! Just like my dentist reminds me, the health of your mouth is vital to your whole body health, so brush twice and day and floss, floss, floss. And just like us, the health of our pet’s mouths is important to the whole dog. Unlike us however, I have yet to see a dog or cat brush their teeth and floss, though that would be an amazing trick. So it is up to us (I speak of myself in the pet parent sense right now) to prevent disease from happening by brushing for them. What happens when you don’t brush your teeth, and don’t get regular cleaning? 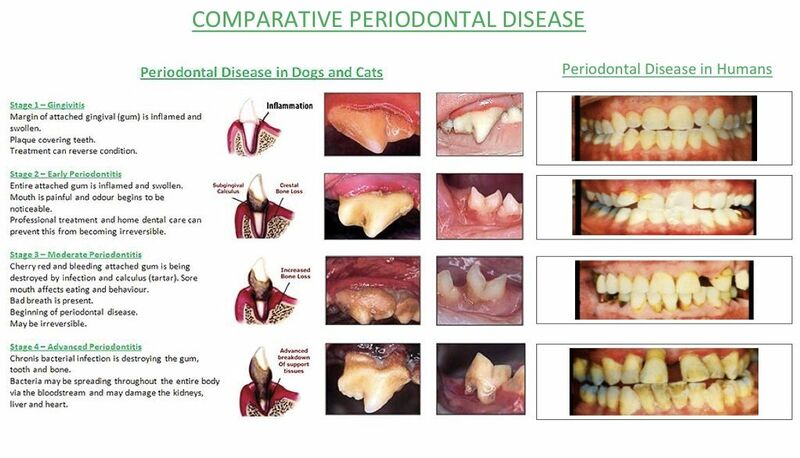 Periodontal disease! That seems like a big nasty word, and it kind of is, it means that the support structure of the tooth gets broken down due to tartar and bacteria which can lead to more advanced disease and even systemic illnesses. Starting from the time the adult teeth erupt through the gums, teeth naturally collect plaque (formed from food and bacteria) a sticky substance that we brush off our teeth daily. If not brushed the plaque hardens to a thicker form called tartar (or calculus) that is nearly impossible to get off without the use of specialized tools. Tartar creates a barrier holding the bacteria up against the gums and the bony support structure of the teeth, thus causing inflammation, and decay of the underlying structures. Once gingiva and bone are lost, teeth become infected, loose and even fall out. Infection in the teeth can become so severe that your pet can suffer jaw fractures or lose all bone in the lower jaw. A recent study showed that about 85% of dogs over the age of three had some form of periodontal disease. All dogs will deal with it at some point in their life. It’s what we do to prevent and treat the disease that determines the longterm outcome. Basic gingivitis is completely treatable and reversible, but once the gingiva and bone is lost, it is gone for good. So if your dog is showing one of the more common clinical signs: drooling, bad breath, pawing his mouth, sore mouth, difficulty chewing, visible tartar, loose teeth, or bleeding from the mouth, he is likely suffering from periodontal disease and needs intervention right away!! Remember oral health is vital to whole body health, dental infections can cause liver, kidney and even heart disease, and bacteria from the mouth can be spread to anywhere in the body via the large number of blood vessels in the oral cavity. If you just can’t stand that stinky dog breath a second longer, it’s time for an oral exam and a plan, let’s treat that periodontal disease and save those 42 chipper-shredders together! !